Glögg is most often based on wine, but we wanted to make a version anyone could drink so instead we decided to base ours on apple juice and make white glögg (glögg often comes in either red or white varieties). You can just as easily use our recipe and substitute the juice for red wine if you want to, or use redcurrant juice instead, which will give a nice bitterness to the drink. *The kind made for baristas/cafés — that you can whip into a foam! Pour the almond milk, spices and dates (remember to remove the pits!) into blender and mix until smooth (or use a stick-mixer). Pour the liquid into a saucepan and heat, without boiling, for a few minutes. Whisk the soy-milk in a bowl until it’s a firm foam. 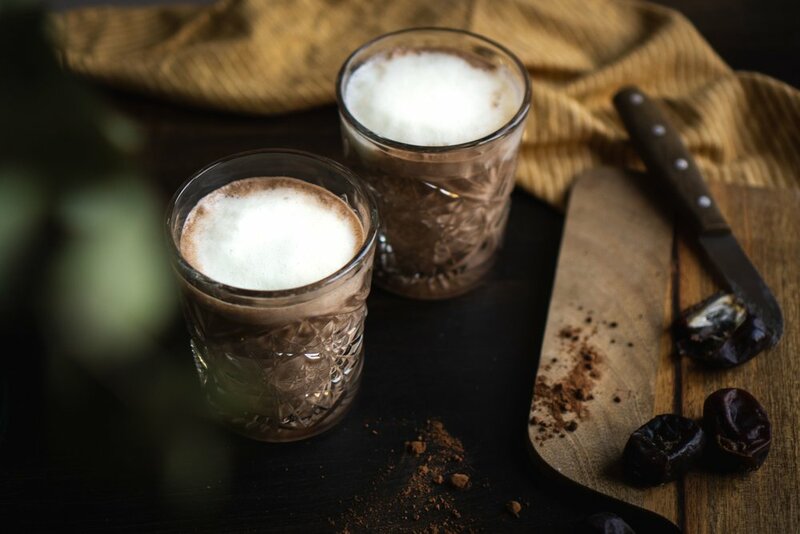 Serve in your best heat-resistant glasses by pouring in the hot chocolate then topping off with the soy-foam and some grated chocolate.